Synopsis:While imprisoned in a Nazi concentration camp, Simon Wiesenthal was taken one day from his work detail to the bedside of a dying member of the SS. Haunted by the crimes in which he had participated, the soldier wanted to confess to--and obtain absolution from--a Jew. 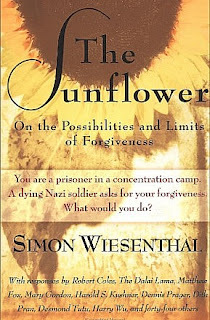 Faced with the choice between compassion and justice, silence and truth, Wiesenthal said nothing.But even years after the way had ended, he wondered: Had he done the right thing? What would you have done in his place? Review: This is more like 2 books in one. The first is the story and the second is responses from scholars, religious leaders, and country leaders on what they would do or what they believe. Its a difficult question with no right answer. Since I've never been in that situation its hard to know what I would do, I probably would do just what he did, although it would haunt me. Its hard to forgive, even harder when the person has committed such heinous acts of cruelty. But if we don't forgive, if we reduce "them" to a subhuman category because of their behavior are we any better than they are? I'm not saying I could do it, but it does give me pause. It reminds me of the Amish parents who forgave the man who shot up an Amish school house. How do you forgive someone who just murdered your child? I don't know. Having compassion for people no matter what is something that is difficult to achieve. I do agree with most of the scholars though when they say you may be able to forgive but never ever forget.